For many years, snowmobilers have gotten the bad rap, mainly due to a few people that just don’t get the sport and what the snowmobiling community represents. We all know these people. They are the ones who race from bar room to bar room, as fast as possible, without any regard for anyone else on the trail. They’re the ones that make up the fatalities headlines in the paper too. We’re all out on the trails for the same reasons: to relieve some stress, take in the wonderful scenery, spend time with friends and family, and just enjoy the snowmobiling experience. All it takes is one of these people who doesn’t respect the sport to ruin an otherwise perfect day. We’ve all seen the phenomenon known as the “Neanderthal Snowmobiler” or “Jack @ss”. You know him. He’s the guy who has a sled and is going to use it no matter what! The sled may be flashy and new; or it may be on its last track and on the way to the snowmobile graveyard. He normally refuses to wear a helmet most of the time. He normally comes unprepared for the sport. As a result, he is a risk to himself and others. Let’s address a few of the problems presented by the “Neanderthal.” I love that name, since it implies a lesser human. I would like to start with helmets. This is a real pet peeve of mine. You can ask any of my friends and the guys I ride with; I won’t hit the trail without a helmet. It could save your life and give you the chance to ride another day. If you ride you should wear a helmet period. This guys still thinks their optional. The big problem for the sport of snowmobiling: drinking and driving. Drinking and hopping on a sled, that probably has a higher horsepower- to -weight ratio than many high performance cars, is a dangerous mistake. Now, it is true that most trails start, pass, or end at a bar room. This does not mean that it is an open invitation to booze it up and go out and kill yourself or someone else. Seven out of ten snowmobile accidents are due to alcohol abuse and many result in death. This is an alarming fact. Our sport does not need these odds. The next time you go into one of the bar rooms or restaurants, try ordering a soda or a cup of coffee with your meal. The group of guys that I ride with will not drink at all when we ride. It is not the time or the place for it. Do you think that the late, great Dale Earnhardt or Jeff Gordon would have a couple of drinks before they climb in to a race car? Of course not! Why should you? Today many states are performing sobriety tests right beside the trail. I think this is a good idea. Some people may not like it, but it will keep the trails safe. If you are going to drink, stay home. If you want to snowmobile, stay sober. Remember, after the second beer, you may be legally impaired and not even know it. Next let’s talk about something that will make snowmobiling more user-friendly and politically correct. When you stop along the trail, pull off to the side. Don’t block the trail so that another sled can get through. This is just an accident waiting to happen when someone is approaching too fast or can’t slow down. Most trails are not very wide. If you can get off the trail, please move over. A year ago, one of the guys I ride with was trying to pass a group and ran over a ski on a parked sled. It was either hit a tree or run over the ski, so he took the ski. We all thought it was going to end in a fight. Thankfully, it did not. Take a lesson from my experience and pull over as far as possible. If you encounter a group of riders that have stopped, use a little bit of tact as you pass them. You don’t have to blast by and show them how fast your sled is. You really don’t need to throw a shower of snow onto them. You really are not proving anything to anyone. Also, a child or person could walk out from in between the machines and no one needs that headache. When you come up to a parked group, pass with care and give them a friendly wave. When you come upon someone that looks like he or she is having trouble with a machine, stop and see if you can help. Sometimes all someone needs is an extra hand or a screwdriver. The next time it could be you that needs a hand or a ride back to a phone. Let’s discuss some common sense things that we all do. When you stop and have your trailside picnic, make sure you pick up your trash. Remember that you carried it in-you should carry it out. There is nothing as disgusting as the sight of a pile or trash or empty cans on the pure white snow. Your mother doesn’t work on the trails; clean up after yourself! If you are riding and someone wants to pass, pull over and let him or her go by. This simple courtesy can avoid an accident that would ruin everyone’s day. It won’t slow you down too much when you decide to use your manners and someone will hopefully return the favor. Don’t be a show-off if you’re at a trailhead or a parking lot. Don’t take off like a bat out of hell or do donuts. All that does is make everyone else think very little of you and the group you are riding with. If you think that you are the next Blair Morgan or Tucker Herbert, take it to the track and prove it. Don’t try it on the trails because someone is going to get hurt. Ride responsibly and everyone will have a great day. Understand the limits of your sled and your riding ability. Most new sleds are capable of going in excess of 75 to 100 miles per hour. If you don’t know how to handle the power or speed of your machine, you should consider getting a smaller sled or learn how to manage what you own. We all dream of being the next snow-cross star but these guys are professionals who are highly trained. They race under controlled conditions. Riding a sled that you cannot handle can go out of control on a crowded trail. Be careful. 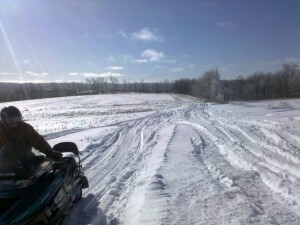 Snowmobiling is a very family-oriented sport. The largest growing part of our sport is the touring aspect. This means more people and families are enjoying a great hobby and sport. These groups are out to have fun just like the rest of us. Give them the room they need. If they are going slower than you are, wait for a proper and safe place to pass. Be courteous. Let’s take care of the trails. Don’t be a throttle jockey and tear them up. The groomers spend hours taking care of the trails for us. I think everyone should join a club and participate in taking care of the trail systems. Speeding on the trails is not only a nuisance for trail maintenance; it can be deadly. Use your head when you use that throttle. You should know what is around the corner or over the next hill. Think about this the next time you go flying into a corner sideways and there is someone coming the other way. It is your choice to keep the trails safe and clean. In closing, I would like to see more people on the trails. Our sport needs to grow and the local communities benefit from the dollars snowmobilers spend. However, I would like to see some more tactful and respectful people on the trails. Use some common sense and courtesy. Respect the rules of the law enforcement community. Pull over and let others pass if you are in the way. Remember that snowmobiling is a privilege and not a right. If you want the trails to ride on, don’t abuse them or the landowner’s property. Otherwise, the next time you come through that area, the trail may be closed and you will have to travel twenty miles out of your way to get home.